When I was in college, I discovered flamenco in films and records. It became such a passion that I began to think I had been Spanish in a previous incarnation. The music and movement obsessed me. I tried dancing to the music, the flamenco way. On my only trip to Spain, I left my sick husband in a hotel room in Madrid to search for it unsuccessfully in the streets of Toledo. We later found a lively couple dancing spontaneously out of the sheer joy of it in a small cafe in Madrid. It was an explosion of feeling, clapping, heels clicking on a terrazzo floor, a guitarist and singer included in the passion. I will never forget it. So it was with much anticipation that I met Carmen Romero before her performance on the CNE’s International Stage last month. 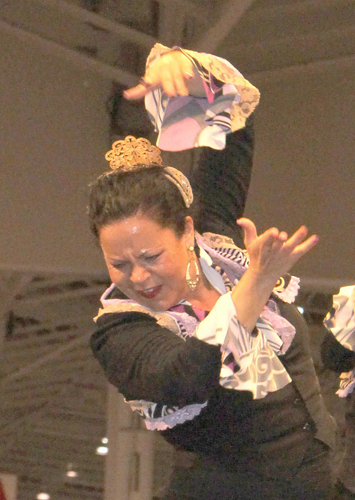 Through her, I discovered that flamenco is not relatively new to Toronto or to the world. Expecting an impatient, temperamental artiste preparing for a show, I was surprised to find Romero gracious and relaxed. 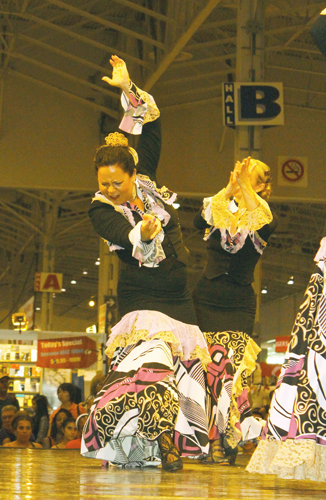 She volunteered that flamenco came from different regions of Spain, and she wanted to give the CNE audience a good sense of the richness of Spanish culture. But flamenco was not just Spanish, it was “Gypsy” and Arab, she said. It was a fusion art form – a result of different persecuted groups coming together in 16th century Spain finding solace in music and dance. In the 1970’s during the Caravan festival, she saw a flamenco dance company perform. She was eight years old and curious. She fell in love with the beautiful and powerful women. She went to a phone book and found the company and got lessons with Paula Moreno. 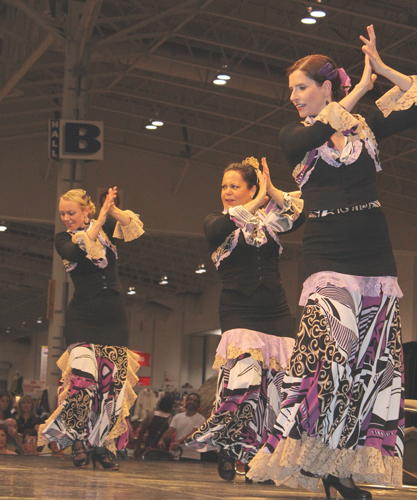 She trained with some of the world’s best flamenco dancers who came then to Toronto on six-month contracts. She danced with the Spanish Club of Toronto and at Canada’s Wonderland. She also studied psychology and, after graduation, began work as a therapist in brain injuries and rehabilitation. In 1991, she started her own dance company and school. Eventually she took the leap and now spends full time teaching and performing. She has danced in Europe, the U.S. and Canada. She has represented Canada in Madrid and Spain in Canada. Today, she has over a hundred students; children and teens of all ethnic groups. She told me about the October 14-20 Toronto International Flamenco Festival. Enviously, I watched her and her company perform after our meeting. I felt grateful to the CNE for giving her a broader audience. (I’ve also seen fiery flamenco at Harbourfront for free.) She and her dancers were powerful and so expressive. Later, I looked up www.torontoflamencofestival.com and discovered that some of the world’s best musicians and dancers will be performing in Toronto, alas at prices beyond the guidelines of our website. But there will be films and free flamenco lessons for beginners on October 13, fantastic opportunities for flamenco fans. If the lessons are booked up for this year, mark your calendar for 2014. They might be available next year. For details, see: www.torontomulticulturalcalendar.com . Ruth. Please share your adventures in Multicultural Toronto with us at: ruthlormalloy@gmail.com. Such an elegant dance, the flamenco. These dresses are quite unusual. Sure enjoyed the performances we watched together last summer at Harbourfront! Interesting that you like is so much, Ruth; so does my honey. PS. The last is should be it. Hard to read this light grey on my screen.